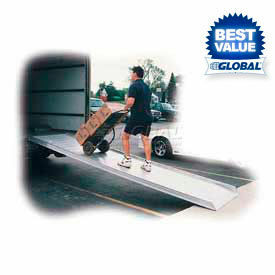 Portable Aluminum Van & Truck Walk Ramps, Lightweight Commercial Truck Mounted Walk Ramps at Global Industrial. Aluminum Truck and Van Walk Ramps allow easy Loading and Unloading Mobility for applications including Moving, Delivery, Shipment and more. Aluminum Truck and Van Walk Ramps are made of aluminum for durability and corrosion resistance. Heavy duty rib reinforcements provide strength and are lightweight for compact storage. Deck features slip-resistant tread for maximum traction. Safety chains are included to connect the Ramp to a Trailer, and 2"H curbs provide stability. Ramp end is tapered for easy access. Ramp types are Apron or Hook. Dimensions and Capacities vary per style. Magliner® Retractable Underbody Truck Slider® Ramps are Built for Tough, Long-Lasting Service. 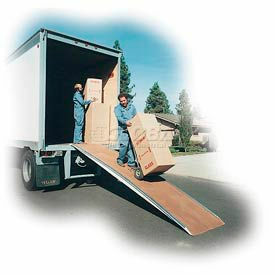 Magliner® Slider® Ramps roll out quickly and store securely under the truck. Lightweight aluminum construction offers easy maneuverability and placement. 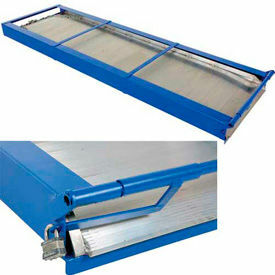 Simply release the lock and pull the ramp out; it rolls out easily on wheels and will stop automatically at the end of the ramp. 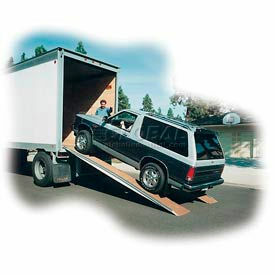 Raise the ramp, place the hooks into the truck sill slots and the ramp is ready to use. Twin-tooth ramp surface offers safe, secure traction in either direction of travel along the entire deck. Anti-rattle springs prevent the ramp from bouncing or rattling when the truck is being operated. 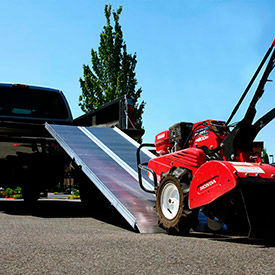 An easy-to-operate automatic safety lock holds the ramp securely in place when stored under the truck body. An integral anti-theft angle stop prevents the ramp from being extended too far, helping to reduce the risk of theft when truck is unattended. Ship completely assembled for easy installation. Note: Not designed for use with Powered Equipment or Pallet Jacks; recommended for Hand Truck use only. Unique Hinged Design allows Ramp to Separate in Half to provide Two Ramps! 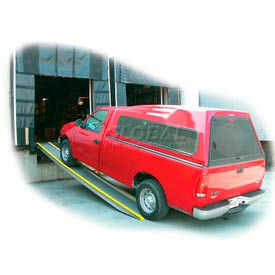 Vestil Fiberglass Autoloader Hinged Ramps offer the ability to load vehicles and other equipment easily. Each 36"W Ramp may be separated in half to provide two 18"W Ramps to load practically anything into or from trucks and trailers. Center Hinge Pins allow Ramps to be used as a single Ramp or two separate Ramps. Ramps are constructed of reinforced fiberglass, marine-grade plywood and aluminum extrusions for long life. Locking Pins are included for securing Ramp to truck or trailer. Abrasive deck surface provides good traction either wet or dry. 1"H curb on each side of ramp for safety. Note: Not for use with Forklift Trucks or Pallet Trucks. Heavy Duty Vestil Fiberglass Ramps are great for Loading and Unloading Trucks! 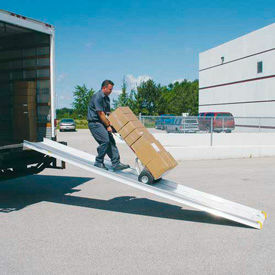 Loading and unloading shipments to and from Delivery Trucks and Semi-trailers is safe and easy using these lightweight Walk Ramps. Great for businesses that don't have a Loading Dock, Walk Ramps help "bridge" the Truck to the ground. Reinforced fiberglass, marine-grade plywood and aluminum extrusion construction provide a durable, Portable Loading Ramp. Abrasive Ramp surface provides good traction in all weather conditions. A 1"H Curb on both sides of the Ramp helps to prevent runoffs. Vestil Aluminum Vehicle Loading Ramps allow the ability to Load Vans and Pickups into Trucks, Tractor Trailers or Buildings. Vestil Aluminum Vehicle Loading Ramps provide a safe means for driving pickups, vans and some passenger cars from ground level into and out of high building entrances, Trucks and Semi-trailers. Locking Pins are included for securing Ramps to a Dock or Truck. Lightweight, high-strength, all-welded aluminum construction with 1-¼" safety side curbs. To avoid hang-ups, measure the under-clearance and wheelbase of the vehicle. Sold in pairs. Save Valuable Space in your Truck! Vestil Truck Mounted Aluminum Walk Ramps include a steel pocket frame for under-truck mounting, with linkage to prevent the ramp from falling out. Ramp is constructed of lightweight welded aluminum that will not rust and features non-slip serrations for extra grip. An integral manually operated Spring-loaded Lock secures the Ramp into the frame. Hand Loops are included to assist with Ramp deployment. Overlap style end lip rests on the trailer bed to provide a smooth transition. Each Ramp includes 2"H side curbs and 2 Chains to connect the Ramp to the truck for added safety. Note: 28" overall Ramp width, 26" usable Ramp width and 29-½" overall frame width. EZ-ACCESS® Traverse™ Singlefold Ramps provide Easy Loading Capability for Job Sites and High Traffic use. EZ-ACCESS® Traverse™ Singlefold Ramps are made of aluminum to provide long lasting durability. Ramps eliminate the need for heavy lifting and reduce lifting related injuries. Folding design with carrying handles sets up easily and provides easy transport and stowage. Full-length, live hinge allows uniform weight distribution and eliminates load deflection. Extruded, slip-resistant surface provides superior traction. Weight capacities are 1000, 1200, 1400 and 1600 lbs. Overall lengths range from 24" - 96-3/16". Service heights are 2 to 10, 4 to 14, 6 to 21 and 6 to 29.